Meet Marcus Speedstar, whose chest plate has a certain Sith vibe, right? 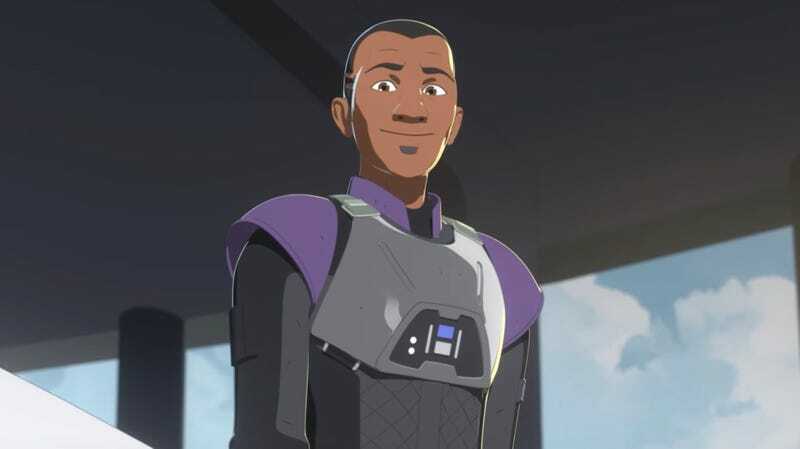 When Star Wars Resistance was first announced, we were told it was a show about racing. And while racing has been on the peripheral for most of this season, it takes center stage in the new episode, “The Platform Classic.” Just not in the way you expect. I’d expected the focus to be Kaz and the Aces, since Lucasfilm has long set those characters up to be the main racers on the show. However, they all take a back seat in the episode (more on that in a bit) in order to tell a story that blends racing with a surprising new relationship. One between Yeager and a new character named Marcus Speedstar. Speedstar (not his real name, unfortunately, but a great one), is not only one of the most famous racers in the galaxy but Yeager’s brother! This is revealed in the first scene so I’m not spoiling anything major. From there, a bitter, decade-long rivalry between the siblings is explored and curmudgeonly Yeager clashes not just with his crew, but his brother, over whether or not the two will compete again. This is what Resistance does best. Tells a compelling, character-driven story with racing as a main component. By the time the episode gets to the race of its title, the event becomes a mirror to the ongoing struggle between the two brothers. They race, but they also hash out their problems, giving what was an already exciting action set piece (and really, the race is so badass I hope they do more like it) a solid emotional core. Yeager and his crew are about to meet Speedstar. In addition to the great main story, the episode even has some links back to the Star Wars world at large. First was Marcus’ reveal that after the Empire fell at the Battle of Jakku, the military underwent significant downsizing, leading to he and Yeager losing their jobs. No wonder the New Republic was so ill-prepared for the rise of the First Order. Then, there was a nice appearance by the Guavian Death Gang from The Force Awakens, who are after Marcus for a debt he owned after an event on Rishi, itself another nice Star Wars wink. (No mention of Kanjiklub, unfortunately). Finally, the whole exchange between Marcus and the Guavians, in a bar, at a table, about a debt, felt very much like a wink to Han Solo and Greedo on Tatooine, minus anyone shooting. All of this together adds up to a dynamite episode of Resistance...with two minor issues. First, once again characters other than Kaz (in this case Yeager and Marcus) are the most interesting ones on the show, and that feels like it could be a problem. Also, during the race, Yeager and Speedstar so soundly beat the Aces, it seriously undercuts characters we are supposed to revere. Here, they are merely names to occupy the low end of the leaderboard, with not one of them getting a significant moment in the race or a line of dialogue. Aren’t the Aces supposed to be the best? Some of our main characters? Sure, Yeager and Speedstar are set up to be better but how can you have a whole episode about a huge race on the platform and the Aces not factor into it in a big way? I really feel like the Aces have gotten the short end of the stick on Resistance, but hopefully that changes soon. They are way too cool to waste. Either way though, the mix of Star Wars references with a largely unrelated, emotional reunion set against a huge action set piece made for a great episode of Resistance. Oh, and one final random thought: How amazing was Marcus Speedstar’s racer? Please make toys of that ASAP.